Ovington village hall was formally the village church school serving the local community which eventually closed many years ago. The building with some land was transferred to the village to be run as a free standing village hall community project, and in these preceding years has been a very successful contributor to village life. Like most things in life over a period of time things like land boundaries can became slightly grey, which was highlighted at the Heritage lottery Fund first public meeting by the chairman of the village hall committee. This had been a recent on going area of concern. The church Glebe Surveyor was requested to attend along with representatives of the committee to agree these boundaries and restore harmony. 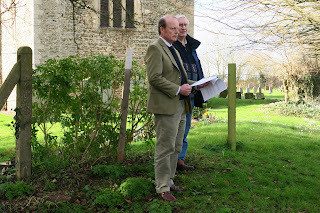 Mr Riley armed with the original deeds of the land transfer along with the Glebe Surveyor were able to agree the definitive boundary lines, and the Glebe Surveyor to implement the changes.